On Seeing Pope Francis. Or Not. In May of 2013, on a warm, sunny morning, I found myself sitting in St. Peter’s Square, the large plaza that welcomes thousands of visitors to the Vatican every week. Our family had the remarkable opportunity to spend that week in Rome, but in the time since we had purchased our tickets, something even more remarkable had happened. A pope had—what? ?—resigned, and a new pope had appeared. And not just any pope. Two months into his pontificate, Pope Francis was already demonstrating powerful magnetism. The crowd gathered for his weekly general audience was huge. After hours of expectant waiting, the moment arrived, and Pope Francis appeared in his white car. We could see that he was smiling broadly, and we all were, too. A collective murmur moved in waves through the crowd, with cries here and there of “Papa!” He was in no hurry, making one turn after another around the square. For those of us gathered, for a moment, there was nothing else. We were there. He was there. We smiled and smiled. For Catholics, there are some theological reasons for all this. An encounter with pope is an encounter with the visible head of the worldwide Church, a sort of personal embodiment of the whole Church, and, even more, someone who represents Christ on earth in a particular and unique way. This pope had only increased that sense, in acts of humility and love, offering himself as an icon of Christ. I was deeply aware of the privilege of standing there, and I remember thinking of and praying for all the people who would have loved to have such an opportunity. I will probably have to offer some explanation, then, for what happened next. Pope Francis was being driven toward the front of the square, was stepping to the spot where he would sit to address us all, was settling into his chair. For me, something completely unexpected was going on: I was seized with a sudden and almost overwhelming urge to leave. Not just to leave St. Peter’s Square, but to leave the Vatican, and Rome, to get on the plane and go home. Immediately. This was ridiculous, of course. All around me, everyone continued to beam, and Pope Francis was just beginning to speak. Now, though, the thoughts were forming in my head to accompany this sudden impulse. I was thinking more about those back at home, and I was thinking about a request Pope Francis had made for his official Inauguration in Rome. Via the Vatican ambassador in Buenos Aires, he asked his supporters in his home country of Argentina that instead of making costly travel plans to come to Rome, instead, they should stay home and give that money to the poor. So, in these momentous days when Pope Francis is here in the U.S., maybe this is something worth keeping in mind. If you can, then go and see Pope Francis. It is a historic moment. The opportunity to see him is a great blessing. But if, like most of us, you can’t, remember the pope’s own advice. Take money you might have spent and give it to the poor. Remember the invitation to meet Christ in the Eucharist, and even in one another. 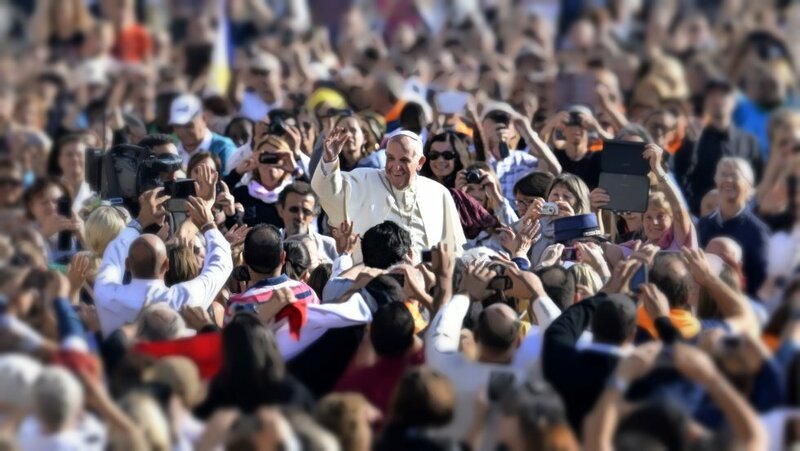 In the coming week, you may be called to something more important than going to see the pope. I didn’t choose the title for this essay at Patheos, but I think it makes it sound Very Important. Here’s the question I was asking: what does it mean–for U.S. Catholics and for all of us–to have the pope here, physically present on U.S. soil?